In 1950 the number of Catholic families in the Emily, MN area was increasing. The nearest Catholic church was 20 some miles to the south in Crosby. Bishop Thomas Welch asked Fr. Roger Crowe, pastor of St. Joseph’s Church in Crosby, to look at the possibility of forming a new parish in the Emily area. A meeting was held at the Emily home of Ray & Anna Hite with many area Catholics in attendance (Joe & Veronica Katzenberger, Thomas Stockard, Ed & Kathy Gilman, Al & Margaret Willet, Frank Diedrich, Jr., Evelyn Gray, Paul Kertzman, Jr., Verna Andrews). At that meeting, St. Emily’s began with prayer, work, willing hearts and hands. With donations of $1,200 Thomas Stockard and Joseph Katzenberger were to find property and a building. Meanwhile the Catholic women formed the Altar & Rosary Society with Margaret Willet as president. On February 20, 1951, the Church of St. Emily (as it was then known) was incorporated and officially became a new parish in the Diocese of Duluth. A building, which had been a Protestant church, and property located just west of the present day Emily Ace Hardware was purchased for $1,500. Much work was needed to remodel the building (new belfry, roof, and interior changes). In the summer of 1952 a people of God, St. Emily’s Parish, had a suitable place to worship and a new pastor, Fr. John Dolsina. On September 7, 1952, parishioners, Fr. John, and visiting clergy gathered to celebrate the official blessing of the church by Bishop Welch. It is interesting to note some first's for the parish of St. Emily’s, especially sacraments received. Nupital Mass was celebrated for Beverly Stockard & Leonard Tepley on January 31, 1953. Holy Communion class (Donald Atwater, Richard, Ronald, & Lynne Valentino, Suzanne Spiess, Dorothy Matros) received 1st Communion on May 31, 1953. Time the new choir sang (Jane Anderson, Director/Ernest Brooks, accompanist) at a Mass was Midnight Mass 1953. St. Emily’s Men’s Club formed on January 10, 1954. Mission held (conducted by Fr. John Bellon) in 1954. 1954 also saw the installation of a new altar donated by the Altar & Rosary Society, the start of a Catholic Youth Organization, and the appointment of two new trustees (Paul Kertzman & Joseph Landowski). After much prayer, hard work, and many money-making events being held, a very happy congregation held a mortgage burning party on January 30, 1955. Later that year, the lot north of the church building was purchased and a three bedroom rectory was built. From 1955-1960 the parish continued to grow. The parish found that on many summer weekends the church was filled to overflowing and people would have to stand on the church lawn under the open windows to participate in the Mass. In 1959 Fr. John and the trustees discussed the acquisition of some property by Emily Lake. It was decided to purchase the property (39922 Lake Street & 21265 2nd Street) with an eye to future expansion. In June of 1962 Fr. Spellman began the process of guiding the parish in building a new church (cost $47,000 plus $8,000 for furnishings-the church was built by Hofman & Sons) at the Lake Street property. In 1977 Fr. Vovk, the trustees (Frank Diedrich & Fran Gfroerer), and most of the parishioners decided that it was again time to expand. A new social hall, kitchen, and restrooms were added to the northeast side of the church (the contractor was parishioner, John Stockard). In 1986 Fr. Roman Spors received a grant from the O’Shaughnessy Foundation for the purpose of building a new rectory (we were still using the original rectory by the old church building). It was decided to construct a new rectory just east of the church on the church property overlooking Emily Lake (21265 2nd Street). In 2003 the church had an opportunity to acquire lots to the north and across Lake Street for overflow parking. In 2008, after celebrating his 50 years in the priesthood, Fr. Spors retired and the Diocese clustered us with our sister parish, Immaculate Heart in Crosslake. And still we keep growing. In 2012 we were able to purchase the empty lots just across Lake Street from the main church building giving us more parking space and we moved to finally put up brick, matching our main church building, as siding for our social hall. In the early months of 2015 parishioners approached Fr. Moravitz and members of the finance council asking if it would be possible to sell our rectory, as it is no longer in use since we are clustered with Immaculate Heart, and use money from the sale toward adding a gathering space, renovating a Confessional space, adding a covered drop-off area, and enclose the walkway to the social hall. After obtaining permission from the Diocese, the rectory was sold in the summer of 2015 and a capital campaign was begun to raise money to expand once again. Under the guidance of Fr. Rozier, the 75% cash-in-hand milestone was reached and in December of 2017 we were given permission by the Diocese to proceed with the next step of our building project. 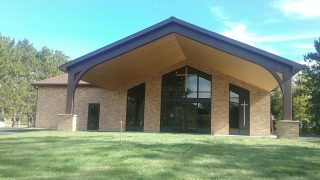 In January 2018 we signed a contract with Baratto Brothers Construction to build our narthex addition (designed by the firm of Widseth, Smith, Nolting) and retrofit the church and social hall with a sprinkler system. Construction on the project was begun in May of 2018 to be completed by September of 2018. Our parishioners and visitors will benefit, especially in cold and inclement weather, from the beautiful new space. Our parishioners have always tried to help others through various outreach and ministries. Our parish's Lenten alms giving program this year was focused on giving to the Mid-MN Women's Center in Brainerd. Our parish cluster has become one of the hosts to New Pathways families three weeks during the year. Our cluster is trying to refine and expand it's outreach to homebound parishioners. As a people of God we are trying to put our faith into action each and every day.